With so much discussion centered on the change to the Definition of ‘Addressing the Ball’ and its effect on Rule 13-2b, a significant clarification to the Rules of Golf has received less attention than I think it deserves. It concerns a less rigid interpretation of the word ‘improve’ with regard to Rule 13-2, Improving Lie, Area of Intended Stance or Swing, or Line of Play. I have provided an illustration of this in the photo above. Prior to 1st January this year a player would have incurred a penalty if they replaced the partly attached divot on their line of play to the hole, even though they intended their next stroke to be a full 9-iron to the putting green. 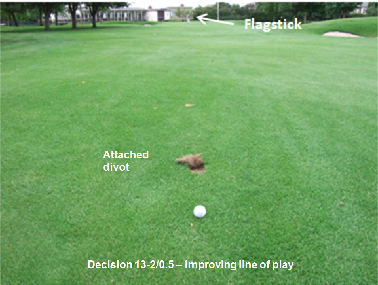 Decision 13-2/0.5 confirms that there is no breach of the Rules unless the player intends to putt across the repaired area, which is obviously highly unlikely in this scenario. “improve” means to change for the better so that the player gains a potential advantage with respect to the position or lie of his ball, the area of his intended stance or swing, his line of play or a reasonable extension of that line beyond the hole, or the area in which he is to drop or place a ball. Therefore, merely changing an area protected by Rule 13-2 prior to making a stroke will not be a breach of Rule 13-2, unless it creates a potential advantage for the player in his play. The Decision lists three useful examples that are unlikely to create such a potential advantage. If a player whose ball lies in thick rough 180 yards from the green, walks forward and pulls strands of grass on his line of play and tosses them in the air to determine the direction of the wind. If a player pulls strands of grass from rough a few inches behind his ball to test the wind, but thereby reduces a potential distraction for the player, or resistance to his club, in the area of his intended swing. The second examples in both of the above sections provide welcome clarification to a golfing situation that occurs quite regularly on the course and has caused much confusion over the years. I know that personally I have been involved in several discussions about whether a player incurs a penalty because they have dislodged a leaf, or leaves, while simulating the stroke that they are about to make. The determination as to whether a player has gained a potential advantage from his actions is made by reference to the situation immediately prior to his stroke. If there is a reasonable possibility that the player's action has created a potential advantage, the player is in breach of Rule 13-2. On a totally different matter, I have just heard about the Tiger Woods lost ball incident at Quail Hollow. There will be a lot of criticism for the ruling that was given in his favour but after reading this account I think that the walking Rules Official probably made the right call. The above content is strictly copyright to Barry Rhodes © 2012 and may not be copied without permission. I strongly recommend that all golfers with an interest in the Rules purchase 'Decisions on the Rules of Golf 2012' for only £9.89 from Amazon via this link. If you do not want to purchase it for yourself you should consider purchasing it for your Club or Society. If you are going to purchase this book or anything else from Amazon, please use this link, as I will then make a few cents affiliate commission. At this year's Tournament Players' Championship on the 17th hole I noted an action taken by Kevin Na that relates to this rule as well as rule 1-2. After he had finished putting, but before Matt Kucher had putted, he (Na) fixed what I assume were spike marks behind the hole on an extension of Kuchar's line. I assume they were spike marks because Na wears steel spikes. If they were spike marks he should have been penalized 2 strokes and if Kucher was complicit, Kuchar could also have been penalized under rule 13-2. I did not witness this incident and cannot find any reference to it. I would therefore be surprised if any penalty was incurred. I can think of two explanations for what you witnessed; a) Na may have been tapping down an irregularity made by a ball, which is permitted, or b) he may have been repairing a spike mark that he had just made, after Kuchar's ball had come to rest, which is also permitted. Barry, you made a good point about Na perhaps repairing a spike mark that he may just have made. That could have been the case, because he does wear steel spikes. However, I have seen players take this exact action a number of times and I have never seen it questioned by another player or by a rules official. If it goes unquestioned, how would a rules official know what the player was in fact fixing? If a Rules Official sees a player repairing damage on the putting green and does not ask the player what they are doing, it is because they are sure that it is damage made by a ball or an old hole plug. Typically, players will say to their fellow competitors, "I'm just going to repair this pitch mark", before they make any repair, so as to show that they are not doing anything that will breach Rule 16-1c. Certainly, all Tour Pros are aware that they cannot repair spike marks and would be penalised if they do so. I don;t think that this is a problem, particularly on a televised event where their every action is being watched closely. Just something that happened to me today that you might be able to clear up. I was preparing for a pitch shot of around 40/50 yds and was taking a practice swing beside my ball, in the normal, bog standard way, say 6 to 8 inches off to the side of the ball (ie at right angles to the direction of shot, but practice swinging towards the target) and I obviously disturbed the grass. Without thinking I tapped this semi-divot/disturbance back down and played my shot. It then dawned on me that I might not have been allowed to do this before I'd actually hit the shot. My playing partners weren't sure, so I penalised myself two shots just to be on the safe side. Was I correct or a bit over zealous ? No penalty was incurred providing you did not improve the area that you intended to stand on to make your stroke. Obviously, the action did not improve your lie, area of intended swing or line of play, as it was to the side of your ball. I had a query on Rule 13 and came across decision 13-2/23 about a player deliberately shaking water from a tree branch interfering with backswing. Can you please tell me, if a player is simply getting into position to take his shot and/or is seeing if he has enough room make a swing or take a stance, and he accidentally knocks drops of water off the trees around him, or does it with a practice swing, would this also be deemed a penalty ? Or is it more properly covered by the decision above (13-2/05) where knocking a few leaves out of many off a tree is ok but knocking a single leaf that might interfere is a penalty ? If we substitute "drops of water" for leaves ? Also, if you are afraid of your ball moving when you ground your club, is it permissible to ground your club say two inches behind the ball (obviously without pressing anything down) just to be safe ? The key word in your question is "accidentally". If the player knocks drops of water off surrounding trees/bushes in approaching their ball and taking a natural stance they do not incur any penalty for improving their area of swing, but if they purposely do anything that results in an improvement to the position or lie of their ball, area of intended stance or swing or line of play they incur a penalty for a breach of Rule 13-2. A player may lightly ground their club anywhere they choose, either in front of or behind their ball, providing they do not press anything down.